Unfortunately, accidents happen. No matter if you have been in a minor fender bender or a major collision, it is essential that your local Mesa collision repair technician checks your Hyundai for damage. Sometimes, damage may not be visible to the naked eye. A bumped bumper, for example, may seem fine, but components behind it may have shifted or become compromised. Any collision can seriously weaken the structure of your car, which can be very dangerous. Excel Collision and Glass Centers has been providing top quality Mesa collision repair services for most makes and models in and around Mesa for many years. We are proud to be able to perform Hyundai certified auto body repairs as well. If you have been in an accident with your Mesa Hyundai, give us a call. Why should you take your Hyundai to a certified repair shop, when your friend can do it for free? Because you want it done right and you want any repair and changes done to your car to be warrantied as well. By adhering to Hyundai’s strict repair guidelines, we are able to offer you top quality repair service that won’t void your warranty and that won’t fail you or cause an accident down the road. If you and your Hyundai have been in a collision in or around Mesa, contact Excel Collision today. We are your premier Mesa certified Hyundai auto body shop. Don’t leave the repair of your car to chance, leave it to Excel! In Mesa, we have convenient locations for you to drop your car at any time to thoroughly inspect and repair its collision damage, in case of a car accident. All of our sites have tools and equipment that are Hyundai certificated to bring any model you may have back to a perfect condition. Most people never repair any damage to their vehicle due to how costly it can be, but Excel Collision Center offers high-quality service at affordable prices. We have the best mechanics in the industry with permanent on-going training and skills to repair any collision damage in your vehicle. When you use our vehicle or car accident repair services, we replace all your parts with high-quality OEM Hyundai body parts. We have the fastest speed in collision repairs in Mesa, but in the case that your car needs to stay with us for a couple of days, you will be contacted to be informed of the progress of your vehicle’s condition each day until it is ready for pickup. Every Mesa location of Excel Collision Centers has the expertise to apply a paintless dent removal with different tools that are designed for specific areas in your vehicle. Our permanent dent removal and repair sessions have been perfected over the years, making a huge difference compared to other collision repair centers. Regardless of the year of your Hyundai’s model, we will take care of any dent, ding, crease, and surface damage on it. You can reach us at our contact information to find more about our services. 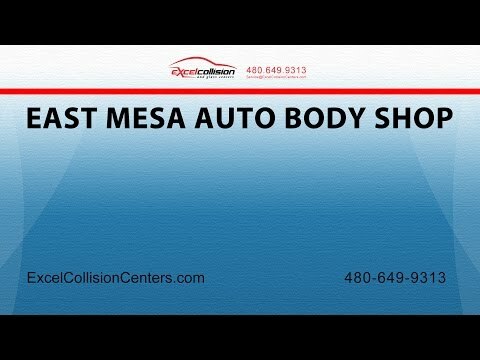 local Mesa manufacturer certified collision centers? In short, we make sure that your Hyundai is in better shape than before the accident. We are not only making it look good, but we reestablish its safety as well. So why should you choose us, when there are so many collision centers in the Mesa area? That’s easy. Because we are the best at what we do. We have several convenient satellite locations for easy drop off and pick up of your cars. We offer loaner cars so you can get on with your life while we take care of your vehicle. And you will never be out of the loop, because we update you with progress reports and photographs of your Hyundai via text or email. And we even deal with the insurance company for you. Excel wants your collision repair to be as easy and enjoyable as possible. We are proud of our well-trained technicians and up to date equipment that allows us to be certified by Hyundai and many other car manufacturers as well. We even have a clean room for aluminum work and repair, as aluminum is highly susceptible to cross contamination from other metals which can significantly weaken it. "The staff at Excel was extremely helpful with the processing of my claim." "Excellent workmanship made a bad situation very tolerable. Thank you!"